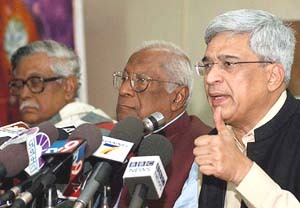 The UPA government embarked on a damage-control exercise with the Left parties and the NDA strongly opposing India’s stand on the Iran nuclear issue and a CPM Politburo meeting this week slated to discuss the question of outside support to the Manmohan Singh government. Should striking airport staff have held the country’s image to ransom? The Iranian crystal ball turned denser and foggier today with Tehran’s announcement of ending all its voluntary cooperation with the IAEA in retaliation to the UN nuclear watchdog yesterday referring the Iranian nuclear file to the UN Security Council. Now, the focus has turned to Iran-Russia talks in Moscow on February 16 to discuss the Russian formula. The government today issued letters of intent to the consortia led by GMR and GVK industries, awarding them the contracts for the two Rs 5,400-crore projects. Reports here suggested that the representatives of the two consortia were handed over the letters during the day, informing them about the awarding of the contracts in accordance with the decision of the Union Cabinet taken last week. 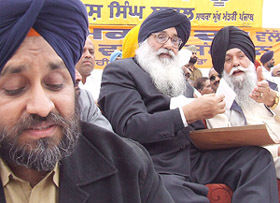 In an attempt to woo trade and industry ahead of the Assembly poll, the SAD President, Mr Parkash Singh Badal, today promised immediate abolition of octroi and setting up of statutory state development boards for large, medium and small-scale industry on the party’s return to power. He also promised a rethink on VAT. If the Communists do not reconsider support to this government, it will be too late to reverse the anti-national course this government has chosen. The much-awaited appellate tribunal for armed forces, which will become a reality once Parliament passes the Bill tabled in this connection and the President gives his assent, will also deal with all pending cases involving disputes between serving and retired personnel of the three wings of the Indian armed forces. In a barbaric act, two youths were burnt to death by about six persons, when they were sleeping in the house here last night. The incident is reportedly the outcome of rivalry between two families in Mandothi village which started about 10 years ago during panchayat elections. In a major pre-poll incident in West Bengal, unknown gunmen shot dead Trinamool Congress vice-president Sachin Mukherjee while he was returning home at Garia in South 24 Parganas district tonight. Chief Minister Ghulam Nabi Azad has said a massive reconstruction programme in the quake-affected areas will be started from April to be completed in a time frame. Mr Azad was addressing a public meeting today at Tangdhar, one of the worst-hit areas by the earthquake in Kupwara district, this being his tenth visit to the area since the quake on October 8 last year.